Following in the footstep’s of Maleficent’s ‘villain’s side of the story’ vibe, Gary Shore’s Dracula Untold attempts to rejuvenate Bram Stoker’s legacy with an origin movie. 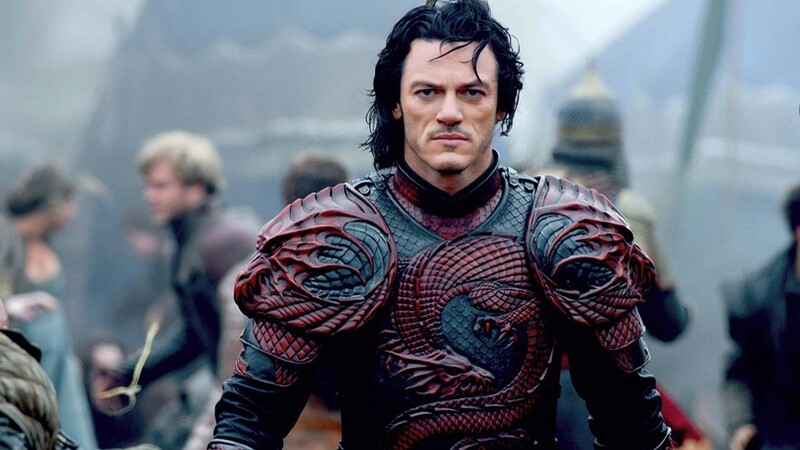 Starring the deliciously brooding Luke Evans as the legendary vampire the film follows him from captured Turk Solider to his rightful seat as the Prince of his Kingdom. Vlad ultimately just wants to lead a chill life, keep his kingdom at peace and hang out with his wife and son. All these rosy plans go to pot when Sultan Mehmed II (Dominic Cooper) comes to him demanding 1000 young boys to train as soldiers. As a child Vlad was handed over to the Turks by his father, this is where he was trained and became known as Vlad The Impaler. Seeing his young son possibly face the same fate spurs Vlad to find an alternative to handing over the boys. This then leads him to the dark cave of ‘The Master Vampire’ who makes him an offer to come over to the dark side…. As creepy as the last sentence may have sounded, Dracula Untold doesn’t dip it’s toes in the horror genre any further than the limits of Master Vampires cave. Charles Dance’s withered, pale and scarred master leans more towards the sort of vampire film you are probably all hoping for, rather than the CGI-heavy, sympathetic and loving Dracula Luke Evans offers up. That is not to say that Evans job isn’t a good one, broody stares and killer jaw/hairline have all the makings of a classic vamp but the films indecision in it’s genre do not support his case. One minute, Lord of The Rings wannabe and the next Gothic romance the film’s intentions are never clear. Am I wanting to see bloodshed and war? Do I want Game of Thrones style family dramas? Or do I just want to watch Vlad and Mirena curled up on the sofa with a brew and Netflix? Big Blockbuster action seems to be the most prominent idea but a few strange and experimental shots can often distract from the gristly goings on on the battlefield. Dominic Coopers Mehmed isn’t all that frightening either, in fact, not at all. He’s also not Turkish. Yet another yarn in the huge tapestry of white actors playing PoC characters, but that’s an entire essay all together. What he and his soldiers do have though is bags of style. I’m all for a good bit of armour and leather-work so naturally this was a dream. Turkish soldiers were adorned with gold plated armour and helmets and the set design is simply divine. It is a shame that so often these gorgeous subtitles and details can get lost upon the films need to constantly be moving in fast forward to cut to a scene of CGI bats which eventually becoming dizzying. I highly doubt that an action based re-vamp (aha puns!!!) of horrors #1 monster is paving the way for a franchise but as long as you don’t really associate Untold with any previous Dracula renditions or think about the history behind it, then it’s a relatively fun and painless popcorn-munching storm. The battle scenes are fun, Sarah Gadon is undoubtedly very very welcome on the eyes and Evans most certainly has a solid presence in period fantasy action flicks and his slight glimmers of the monster we all love definitely do not go unnoticed in amongst his flurry of bats and swords but I think for the time being this is one movie that needs a nail in the coffin.